This unit is a extension for the 9-band preselector and provide confortable functions to control it with buttons and backlight LCD display or over a serial CAT interface. The controller show all system functions and actual status ofr band filter, pre amp, attenuator and TX/RX switching. If the remote interface used, the controller show the actual status of remote lines and give you all informations what you need. The controller unit have a button panel with 6 micro buttons and a real RS232 interface for CAT communication. Main functions like pre amp., attenuator or bypass function have an own buttor for easy access. The bandfilter are selected with Up / Down buttons. Th esytem have 9 pand filters but it can controll more. Over the 10m band setup exist two setups as extension. iths called EX1 and EX2. both "filters" switch a signal line to ground and can use for other systems or a e.g. external 6m filter. The signal line from EX1 is also available at remote interface. For both setups are the signal line connections available at pre amp board. 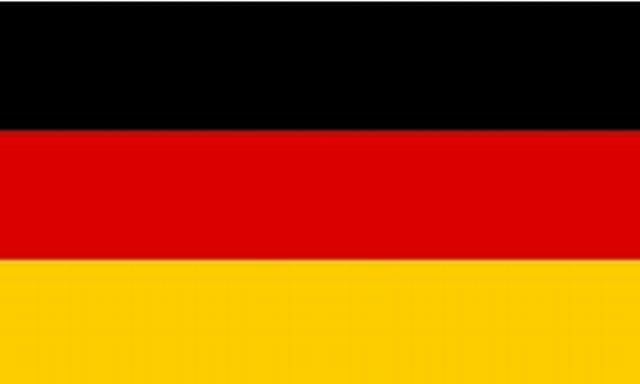 EX1 is pin 13 and EX2 ist pin 14. The status of signal lines from remote interface have priority in the system. If one signal line active, then can this function not switch off by other control interfaces. The Display show all status informations of the preselector include remote switching. The bandpass filter supress outband signals with ca. 30dB, this are 5 S-steps at a S meter. The filter supress strong signals from bradcast services or sations from low bands and reduce the signal strengths for the TRX mixers. These function helps the radio to receive a clear signal and not a mix with cross modulation products and all other signals together. Modern receiver concepts works often with a wide RF frontend and a DSP system in ZF area. A preselector unit is often missing and this radio types have often problems to work with big antennas and stron RX signals. Specially the "All in One" magic boxes from popular manufacturers show this blocking and cross modulation effect in combination with big and full size antennas. You can detect it at low bands in afternoon, when all stations work with more as "normal" TX power and QRM is bigger as the signal of the station. The selection of filters is very strong and outband signals are supress. You can cehck this when you select at TRX a other and as at preselector. The S-meter is clos to standby position (S2-S3) and when you select the correct band filter you get S9+ for the same station. If a filter setup wrong, you get the feeling your antenna is not connected. The controller can connected via a 20 wire flat cable at 20 pole pinhead on pre amp pcb. The cable is include with the controller, LDC Display and button panel. The connetion point for controller installation is available at all shipped systems. But a small modification is requiered for show the correct function of VOX system, when the controller unit is installed. At pre amp pcb is a PTT/VOX jumper. This jumper need a permanetly connection between PTT pin and center pin. You can use a solder iron for that. Only when the connection exist, the controller display the TX/RX switching in VOX mode. 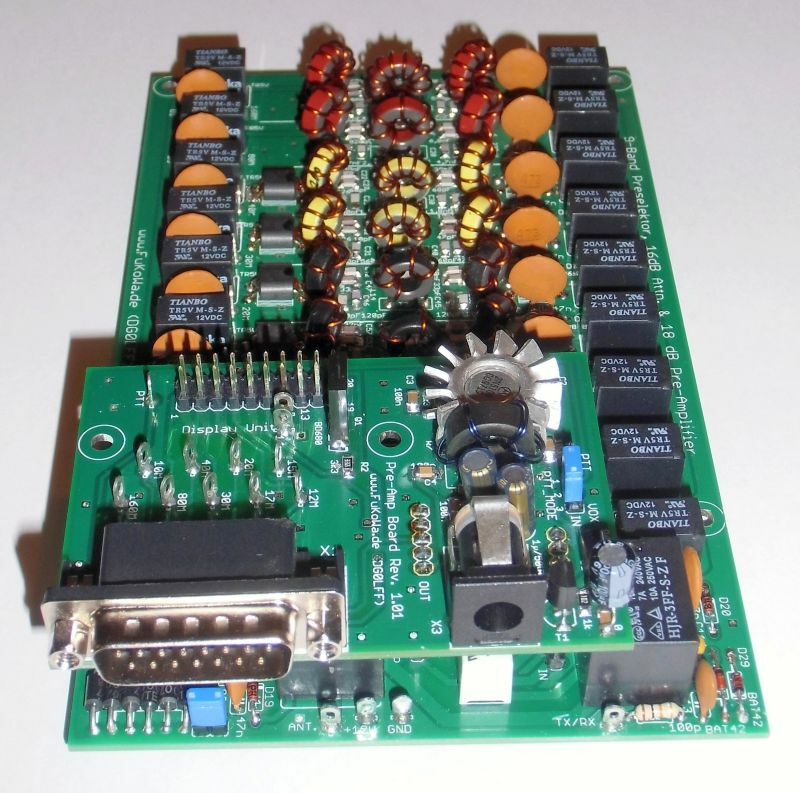 The controller pcb have a own power supply with a 5V linear voltage regulator. This board get the 12volts power from pre amp board over the 20 wire flat cable. The controller unit works with a 8 bit micro controller and a I/O extension with follow Dartington circuits, to drive the 12V signal lines to ground. The controller use the signal lines frome remote interface for control the preselector. These lines are the same lines from the 15 pin sub-d connector at backside. The diplay function of system status works with a voltage measurement at signal lines and translation for the display. 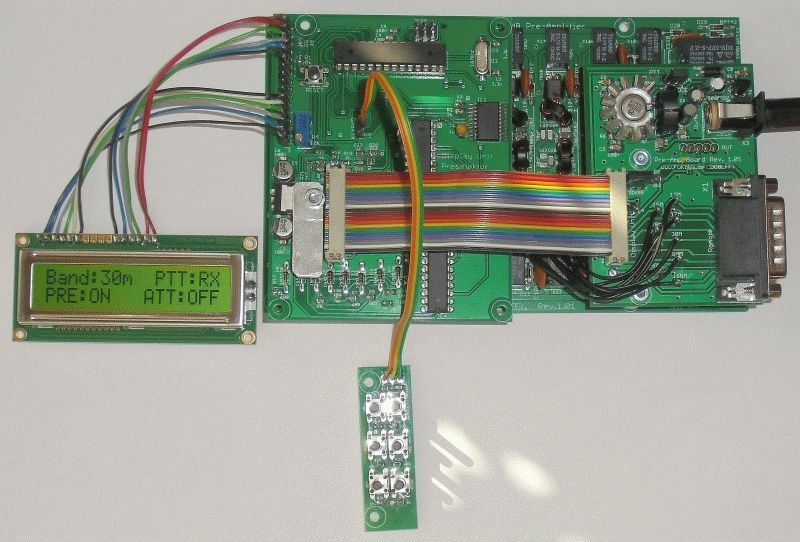 At this board is a UART lever converter from Maxxim for the serial interface installed. You don't need a additionally level converter to connect the system to your PC, its all built inside. The display contrast can control with the blue poti close to display connector. The LCD display is a HD44780 kompatible 16x2 display with a KU0066 LCD controller. 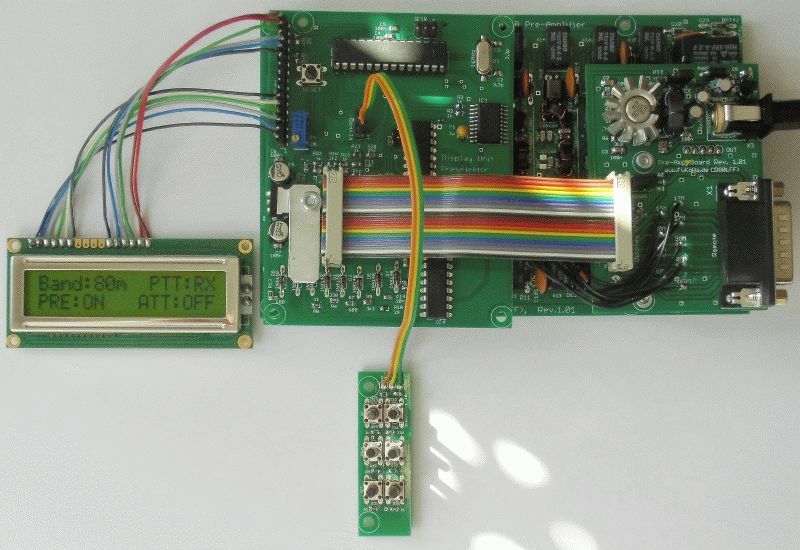 The connection between display and microcontroller are a 4 wire bus. The hardware reset button for microcontroller reset is also close the display connection port. When you press this button, the controller will restart and switch to start setup. The size of this board is 100 x 77mm. The LCD display have a yello LED backlight and can show 16 characters at two lines. You can see every time the active band and staus of pre amp, attenuator and TX/RX switch. When you use a remote function, the display will show every time the actual setup of the preselector. The 1. line show the selected band and TX/RX function, 2. line works for pre amp, remote information (@ or smiley) and attenuator. When you use the remote interface, the display will show a smiley in middle of 2. line, when a filter is selected. If you use the CAT interface, the display show a @ in the second line. This @ sign should show the active CAT status and the connetion to a PC. The size of LCD are 80 x 36mm. The micro buttons are a long version with 12,5 length. In this button format can the button panel easy integrate behind front panels. The pcb have two holes for screws to fix it behind front panel. The size of button panel are 54 x 17mm. The controller pcb have teh dimensions of 100 x 77mm. 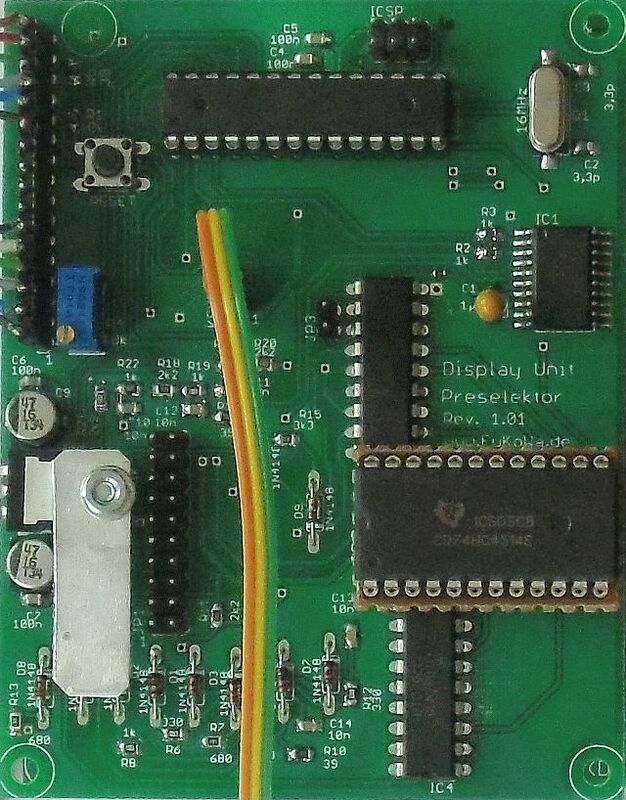 This board should placed over the main filter board and is then in one line with the pre amp pcb and remote interface connector. The installation in a case should in two layers. Bottom layer is the main filter board and the second layer are the pre-amp and the controller board. ==> Between filter board and controller unit should a metal plate as shielding between. The most standard cases have many milling lines to install the pcb in different positions. In one position between can sleve a thin alummina plate (100 x 80mm) and work as shield to protect the filter board for noise from controller board.